“This is such a great turnout!” was something I must have heard come out of my own mouth somewhere between 20 and 30 times during the East Side Riders’ Ride4Love last weekend. I mean, they always get a good turnout. Last year, just under 200 cyclists showed up for the event. 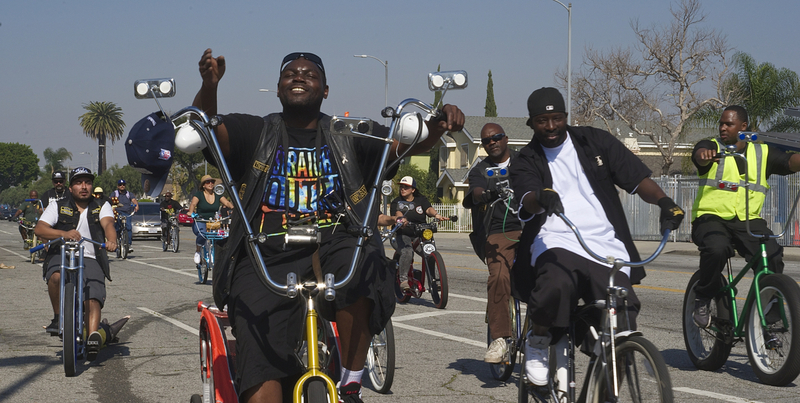 But I still clearly remember the days when it was a struggle to get folks to come to Watts — the days before people believed there could be such a thing as a South L.A. bike community and the days before the clubs around South L.A. and the larger Southland were so well-connected and supportive of each other. 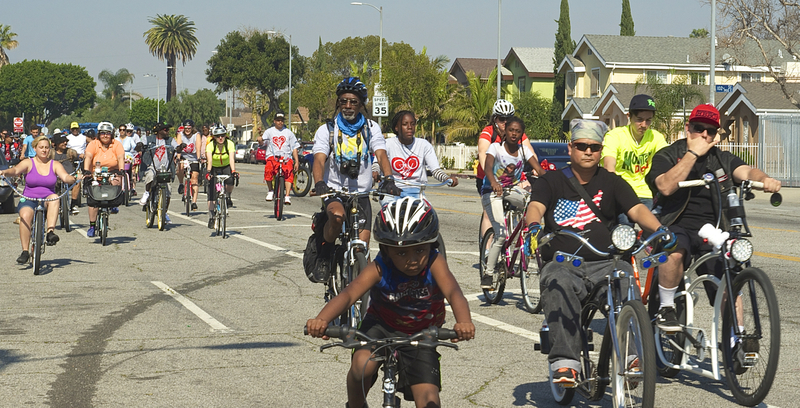 So, I would not be lying if I said that seeing more than 200 riders of all origins, stripes, and ages rolling in harmony through the streets of a community I love so much made my heart feel like it might burst. Decoration on the handlebars of a ride participant. Sahra Sulaiman/Streetsblog L.A.
A bursting heart, however terribly cheesy it may sound, was actually quite apt for the day. 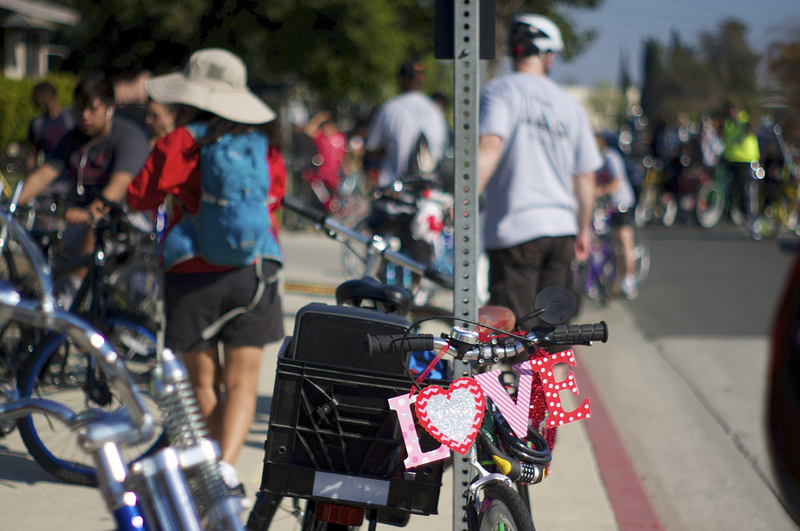 The Ride4Love is the East Side Riders’ (ESRBC) signature event, timed to coincide with Valentine’s Day and intended to highlight both the beauty of and the challenges remaining in the Watts community. 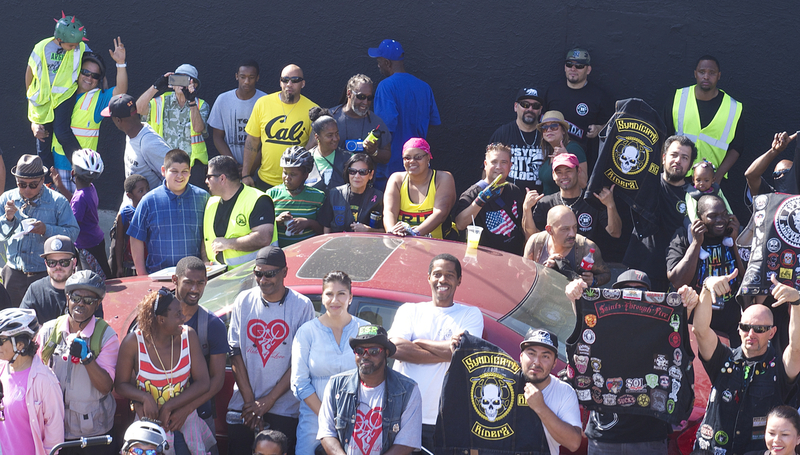 Giving back to the community has always featured heavily in the event, either through more direct action, like feeding the homeless, or by setting an example of positivity for the community by showing that the African-American and Latino communities are stronger when they ride together as one. Recognizing that they were a largely local group, the community was thrilled to see them. Observers honked, waved, called other family members outside to witness the river of bikes, ran out into the streets, stopped cyclists to ask about the event, filmed them with their phones, traded jokes with riders they knew, and asked how they could join in. 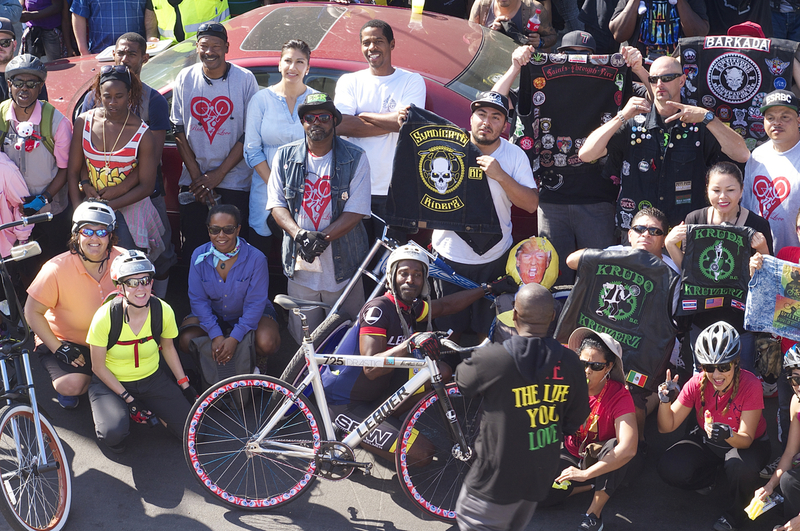 There is something very powerful about seeing the connections the ESRBC and Los Ryderz (another group that rides out of Watts and often collaborates with the ESRBC) have built with other Southland bike clubs grow deeper every year. Many of the clubs have now ridden in several Watts events. Other participants were inspired to launch their own clubs or bring their friends and families to this year’s ride. Big wheels. Sahra Sulaiman/Streetsblog L.A. 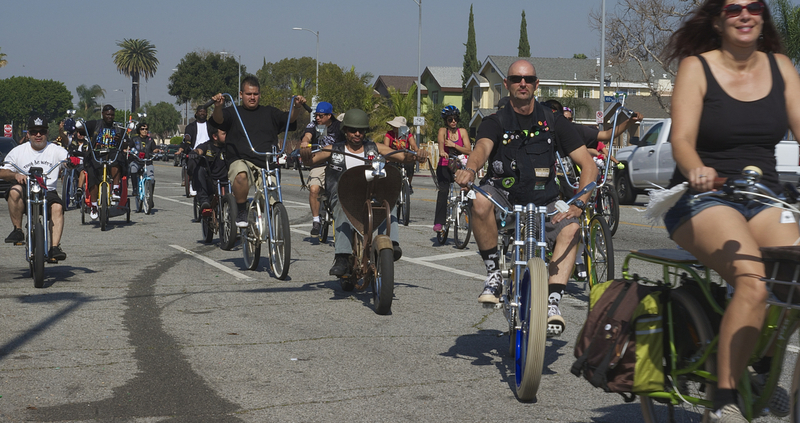 Still others are coming back, almost as veterans, and helping newer generations ease into riding or customizing their bikes. Custom bikes. Sahra Sulaiman/Streetsblog L.A.
And the youth that grew up participating in the ride have not only remained positive and community-oriented, but are now also talking about going to college and planning for their future. 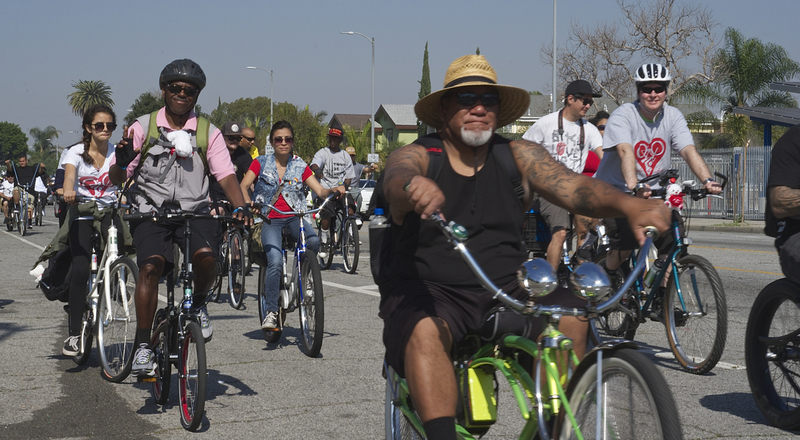 From cruisers to road bikes — everybody rides. Sahra Sulaiman/Streetsblog L.A. Considering Watts recently commemorated the 50th anniversary of the Watts Riots and continues to struggle with safety in the public space, forging a better relationship with law enforcement, providing hope and opportunity for young people, building black and brown unity, and countering long-standing negative stereotypes, these victories are no small feat. Always be Batman. 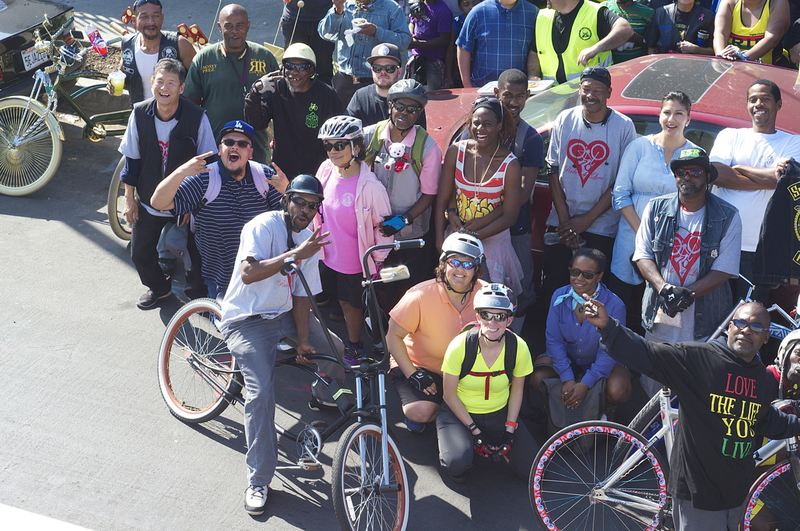 Sahra Sulaiman/Streetsblog L.A.
That said, perhaps the greatest step forward in building community unity was made by Carlos Molina of the Syndicate Riders. 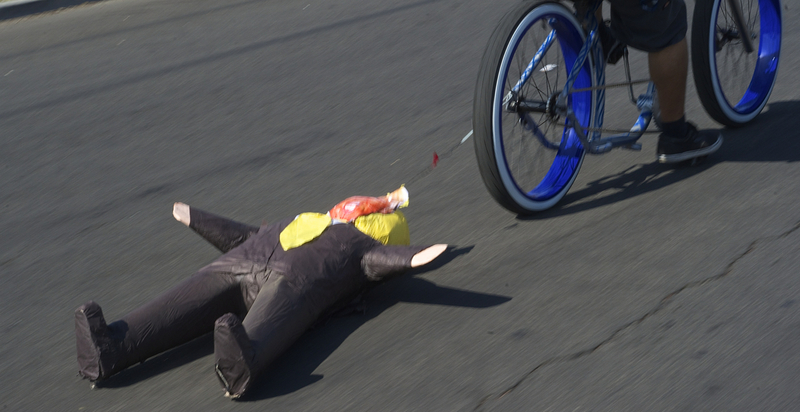 He spotted a Donald Trump piñata in a liquor store and decided it needed to join the ride. Much like in his mystifying presidential campaign, Trump was surprisingly durable, lasting almost the entire ten miles and eliciting cries of delight from almost everyone who saw him in his rather undignified state. Trump makes an appearance in Watts. Trump shenanigans aside, the day was about celebrating new beginnings in Watts. The ride began at the opening of a new healthy eatery, the Hamwich Shack, and made a pit stop at Roy Choi’s buzzworthy and recently-opened Locol. Being able to get fresh, healthy, reasonably-priced food at welcoming sit-down restaurants is a signal the community is beginning to grow from within. And it is something residents hope to see more of. Outside Locol. 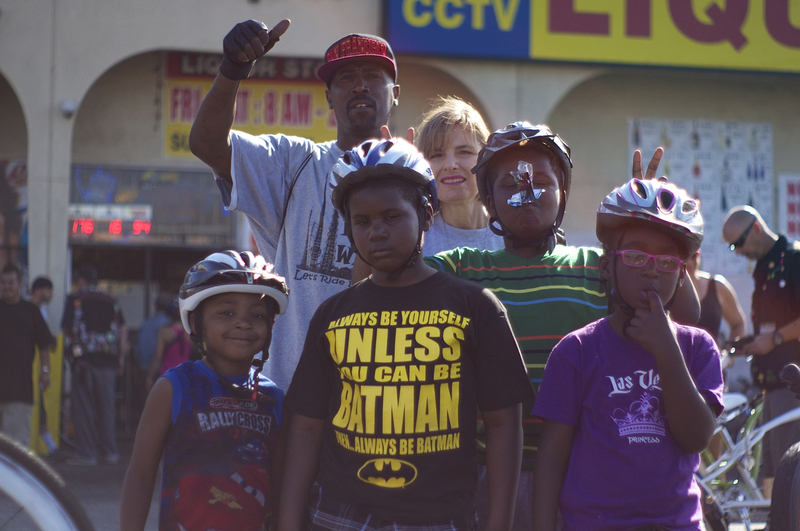 Sahra Sulaiman/Streetsblog L.A. 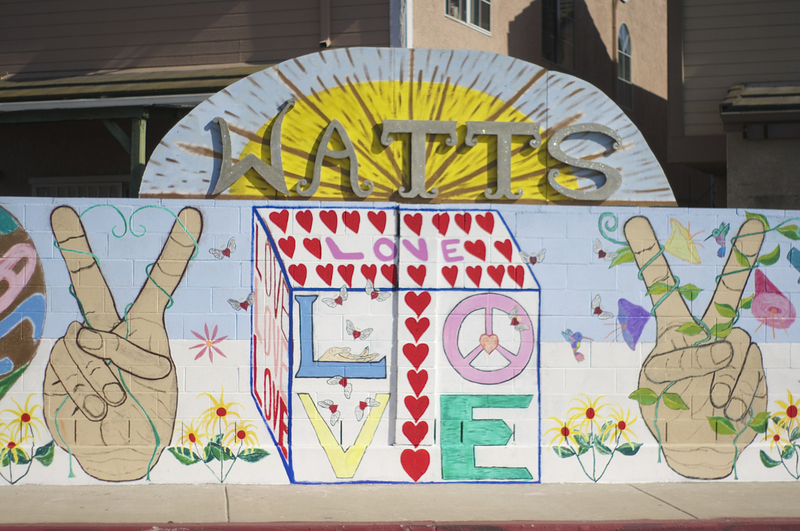 If you missed the Ride4Love, fear not — Los Ryderz will host their annual Tour de Watts on March 12. 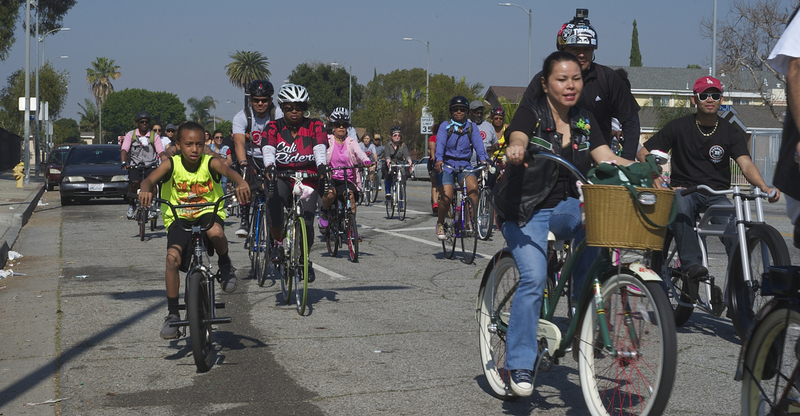 And if you can’t make that event, CicLAvia Southeast is gearing up for a May 15 event which will give participants the chance to tour South Gate, Lynwood, Huntington Park, and Watts.